I've noticed that you are giving lectures on native perennials, trees and shrubs, and I also see on your website you specialize in native plants. What exactly is a "native" plant? A native plant is one that evolved naturally and was growing here prior to arrival of European settlers in the 17th century. These plants are the foundation of our local natural communities. They have co-evolved and adapted over thousands of years to the soil types and weather conditions of our region while interacting with distinct communities of microorganisms, insects, mammals, fish and birds. Birds, butterflies, bees, beneficial insects and other animals prefer native plants for food, shelter and nesting places. The variety of birds, insects and animals attracted to native plants provide natural pest, disease and weed control in our landscapes. 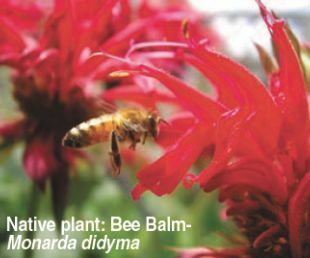 Native plants also play a role in attracting these creatures back into our landscapes as pollinators. Native plants are rugged and require fewer resources and less maintenance to thrive. When I design gardens, I always try to incorporate native plants into the design. There are many great choices available for a variety of garden habitats. As always, the key to a good garden design is putting the right plant in the right location since not every native plant will be a good match for your garden. You must do your homework and know your plants. To help you in learning native plants, Sprigs & Twigs has produced a high quality, glossy, 44 card set (the same size as baseball cards), called "Native Plants of Connecticut- Perennial Series" that shows a picture of the plant on the front and a complete description of characteristics on the back. The set comes in a plastic case. If you would like to have a set, you can pick one up at our office, 41 Kings Hwy, Suite 207, Gales Ferry for $12.75 (includes sales tax), or call us at 860-235-0752 with a credit card and we can mail a set to you for $15.00 (includes sales tax).